Pick up your unsold items at the designated pick up time. We highly encourage you to donate your unsold items! You will receive a tax deductible receipt for your donation and they go to support great local charities! JBF St. Charles is excited to partner with our choice charity Butterfly Haven! In 2018 we were able to donate $26,000 worth of items to Butterfly Haven!!! Just Between Friends consignors, nationwide, achieved amazing numbers last year for charitable donations. We love that you are generous with our community partners! Last year, Just Between Friends, franchisewide, donated a total items valued at $7.6 MILLION. These donations went to hundreds of charities who serve valuable roles in our JBF communities. We are so proud of our consignors for this accomplishment. YOU continue to exemplify Just Between Friends' dedication to families and children. Way to go! We salute you! Butterfly Haven’s mission is to enrich the lives of children in foster and crisis situations. 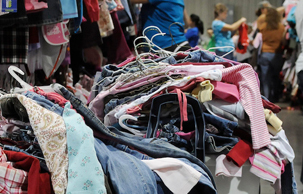 They offer the chance for foster families to come and "shop" for free in their store. All of the donated items will go to the Butterfly Haven to fill the store. Donated to Butterfly Haven: email: gretchinmcdaniel@jbfsale.com for the donation form.